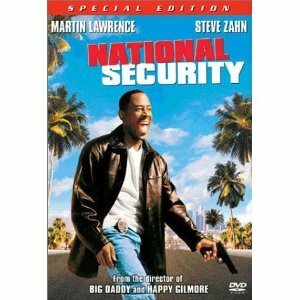 National Security (DvD, Special Edition) starring Martin Lawrence, Steve Zahn, Eric Roberts. Martin Lawrence stars in this action comedy directed by Dennis Dugan (HAPPY GILMORE). The film concerns an unlikely partnership that forms between two L.A.P.D. rejects. Hank (Steve Zahn) is a straightlaced L.A.P.D. officer who is fired after supposedly brutalizing an innocent black man. It turns out the "victim," Earl Montgomery (Lawrence), is actually just an angry citizen who is allergic to bee stings. Frustrated after being dismissed from the L.A.P.D. academy due to his bad temper, Earl seizes the opportunity to take out his rage on the hapless Hank. But six months later, when Hank is released from prison, he is determined to avenge the death of his partner. Their paths cross once again when Nash (Eric Roberts), the man who pulled the trigger, robs the warehouse where Earl is employed as a security guard. Angry that Nash refers to him using a racial slur, Earl attaches himself to Hank, who wants nothing to do with the trash-talker. But Earl won't back down, and the bickering pair begin to infiltrate the crooked police department that rejected them months before. NATIONAL SECURITY features yet another standout supporting turn from the always reliable Zahn.